This Creamy Tomato Orzo Soup is easy to make and loaded with flavor. It's the perfect meal on a cold winter day! Using a Dutch oven or large saucepan, add olive oil and place over medium heat. Once hot, add onion and saute, stirring occasionally, for 4-5 minutes. Add garlic, brown sugar, salt, pepper, basil and oregano; stir and continue cooking for 2-3 more minutes. Add tomatoes, chicken stock and Parmesan cheese. Bring to a simmer and cook uncovered for 15-20 minutes, stirring occasionally. Meanwhile, cook the orzo pasta according to package instructions; set cooked pasta aside. Using an immersion blender, blend the soup until smooth. Stir in cooked orzo pasta and Greek yogurt. Before serving, garnish with feta cheese and fresh basil. 2 cups of chicken stock yields a fairly thick soup, but that's how I personally like it. 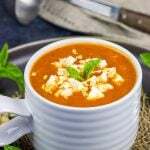 Feel free to add up to 4 total cups of stock to thin this soup out a bit...it's your choice!